My little jewel is 3 months old today! Could I convince you that this was Ruby's attempt at a supermodel pose? She's so cute! Lovin' the hat!!! Happy three-months, Ruby! And congratulations, Mom! 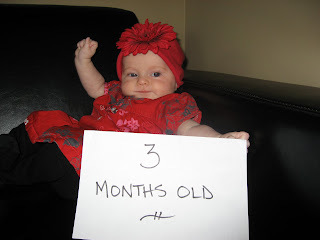 Ruby, happy belated 3 months!!! Wow, time goes by fast and she is sooo cute.